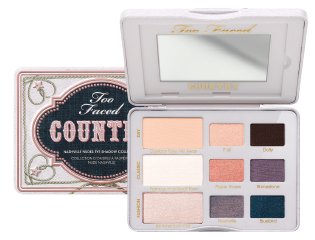 Too Faced has a couple of eye shadow collections coming out June 1, so if you're a little bit country or a little bit rock n' roll, these palettes are for you! A dose of studs, spikes and smokey shadow can go a long way in making you feel like a total badass. 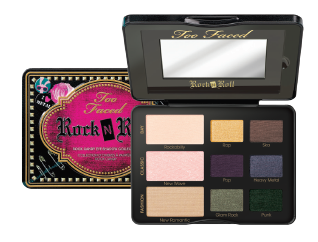 Release your inner rock star with our new Rock N Roll Eye Shadow Collection featuring nine matte to metallic edgy shades that will guarantee you a backstage pass. Our signature Glamour Guide shows you three beauty looks to get you started so you can create looks you love and own it like a rock star. Grab yourself a mason jar of sweet tea and fall hard for Music City glamour. We captured the Southern capital’s charm in our new Country Eye Shadow Collection featuring nine Nashville favorites with a sparkling pop of color for a look that goes with everything, just like your cowboy boots! Our signature Glamour Guide shows you three beauty looks to get you started so you can create looks you love and own it like a country star. Omg!!!! I cant wait!! I love too faced eyeshadows! They always come in cutest packaging!